Another point to note is that with the release of the ASP.NET routing in .NET 3.5 SP1, we are able to create SEO friendly URLs that do not map to specific files on disk. The routing is part of the core runtime environment and therefore can be used by both WebForms and MVC. To run both frameworks side by side, we could easily create a separate folder in your MVC project for all our WebForm files and be good to go. What this post shows you instead, is how to have an MVC application with WebForm pages that both use a common master page and common routing for SEO friendly URLs. A sample project that shows WebForms and MVC running side by side is attached at the bottom of this post. So why would we want to run WebForms and MVC in the same project? WebForms come with a lot of server controls that provide a lot of rich functionality. One example is the ReportViewer control. Using this control and client report definition files (RDLC), we can create rich interactive reports (with charting controls). 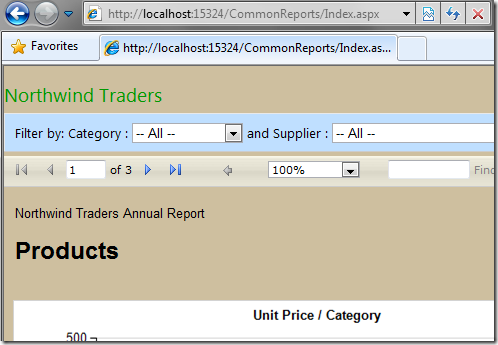 I show you how to use the ReportViewer control in a WebForm project here : Creating an ASP.NET report using Visual Studio 2010. We can create even more advanced reports by using SQL reporting services that can also be rendered by the ReportViewer control. Moving along, consider the sample MVC application I blogged about titled : ASP.NET MVC Paging/Sorting/Filtering using the MVCContrib Grid and Pager. Assume you were given the requirement to add a UI to the MVC application where users could interact with a report and be given the option to export the report to Excel, PDF or Word. How do you go about doing it? This is a perfect scenario to use the ReportViewer control and RDLCs. As you saw in the post on creating the ASP.NET report, the ReportViewer control is a Web Control and is designed to be run in a WebForm project with dependencies on, amongst others, a ScriptManager control and the beloved Viewstate. Since MVC and WebForm both run under the same runtime, the easiest thing to is to add the WebForm application files (index.aspx, rdlc, related class files) into our MVC project. We will copy the files over from the WebForm project into the MVC project. 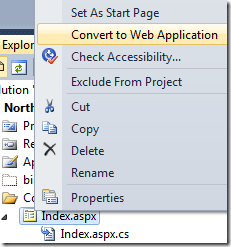 Right click on the Index.aspx file and convert it to a web application. This will add the index.aspx.designer.cs file (this step is not required if you are manually adding a WebForm aspx file into the MVC project). There are two issues with our page. It does not use our site master page and the URL is not SEO friendly. The easiest way to use master pages with both MVC and WebForm pages is to have a common master page that each inherits from as shown below. The reason for this is most WebForm controls require them to be inside a Form control and require ControlState or ViewState. ViewMasterPages used in MVC, on the other hand, are designed to be used with content pages that derive from ViewPage with Viewstate turned off. 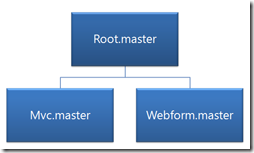 By having a separate master page for MVC and WebForm that inherit from the Root master page,, we can set properties that are specific to each. For example, in the Webform master, we can turn on ViewState, add a form tag etc. Control 'MainContent_MyButton' of type 'Button' must be placed inside a form tag with runat=server. Since the ViewMasterPage inherits from MasterPage as seen below, we make our Root.master inherit from MasterPage, MVC.master inherit from ViewMasterPage and Webform.master inherits from MasterPage. We make changes to our reports aspx file to use the Webform.master. See the source of the master pages in the sample project for a better understanding of how they are connected. We want to create SEO friendly links that point to our report. 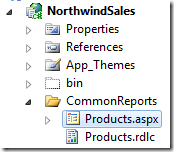 A request to /Reports/Products should render the report located in ~/CommonReports/Products.aspx. Simillarly to support future reports, a request to /Reports/Sales should render a report in ~/CommonReports/Sales.aspx. Lets start by renaming our index.aspx file to Products.aspx to be consistent with our routing criteria above. As mentioned earlier, since routing is part of the core runtime environment, we ca easily create a custom route for our reports by adding an entry in Global.asax. With our custom route in place, a request to Reports/Employees will render the page at ~/CommonReports/Employees.aspx. We make this custom route the first entry since the routing system walks the table from top to bottom, and the first route to match wins. Note that it is highly recommended that you write unit tests for your routes to ensure that the mappings you defined are correct. We want this menu structure to be common to all pages/views and hence should reside in Root.master. Unfortunately the Html.ActionLink helpers will not work since Root.master inherits from MasterPage which does not have the helper methods available. The quickest way to resolve this issue is to use RouteUrl expressions. Using RouteUrl expressions, we can programmatically generate URLs that are based on route definitions. By specifying parameter values and a route name if required, we get back a URL string that corresponds to a matching route. We are done adding the common navigation to our application. The application now uses a common theme, routing and navigation structure. Use a common menu structure for both WebForm and MVC. The sample project is attached below. Great article Raj. Just what I was looking for. Thanks for taking the time to put together the instructions and sample project. Very useful. I was having a 'control not found error on my aspx pages' and converting the pages to web application format solved it. I have a page let say a sales page, is there any way to view the sales page without menu or anything else, just the table containing a sales report?